- for FATWARE 0.12 only ! ! ! FDISK can also fix problrmatic CF cards that is impossible use with FATWARE system. This CF cards can be detected, but FATWARE show "0 volumes" (CF card is formatted without MBR sector). 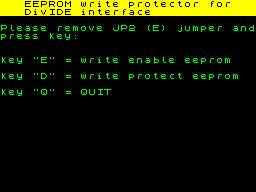 EPROTECTOR - write protector for eeprom AT28C64B. This utility use eeprom software write protect feature and work only with eeprom type 28C64B (with "B" !!!). 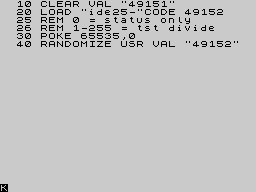 It's photo of old unsupported AT28C64. After press key "D" will eeprom protected and all system flasher utilities will ignored. Before rewriting eeprom you must load EPROTECTOR and press key "E" for enable writing + load any system flasher(intalator). After flash system to eeprom you can load EPROTECTOR and press key "D" for write protection. 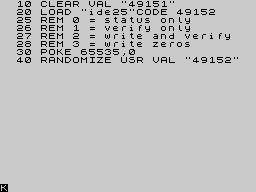 2) at adress 8191 is code 201(RET) - this is map-off area and is used for correct return from DivIDE memory to ZX rom. 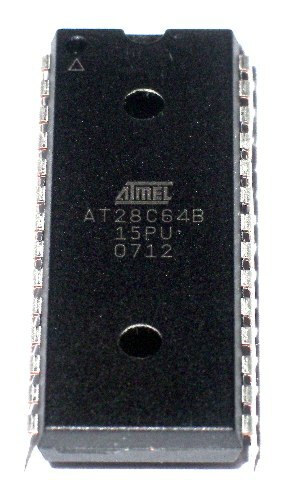 ALLRAM INSTALATORS - different ZX roms for old DivIDE without 16kB allram support. This instalator active mapram mode,connect DivIDE memory to low 16kB and write ROM image to DivIDE ram. (only low 8kB is write protected, area 8192-16383 is always write enabled. Test read/write/status stability on DivIDE with IDE disc. Rewrite value "0" at end of basic line 30 for change function. Easy version of IDE25 utility. Test only read stability on DivIDE with IDE disc. 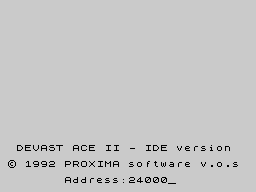 Utility for install software to DivIDE eeprom or ram (mapram mode). Can set also any DivIDE ram bank 0-3. D40/D80/MDOS3(HDD)/TAPE support.